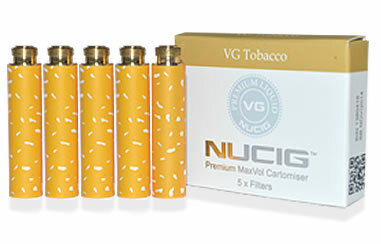 The NUCIG replacement e cigarette cartridges are prefilled and ready to use, available in different pack sizes to save you money. The electronic cigarette cartridges are all VG based 60%-75% depending on flavour and strength to provide smooth vapour and with a really great taste. E Cig cartridges are available in different styles for the different kits and possible in a number of different flavours. All our e cigarette cartridges with nicotine or without with up to 5 different strengths depending on your kit. Contact our team if you need assistance or advice. A cartridge/filter + atomiser all-in one unit. As provided in the value, starter & full kits. Each cartomiser is the same as about 30 cigarettes. Each cartridge/filter is the same as about 80 cigarettes. 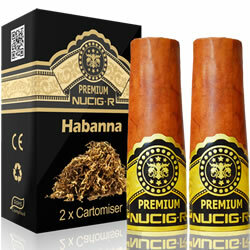 Choose from 3 different flavours including original Habana, Golden Tobacco and Cuban. USB cartomiser pack sizes of 2 - 20.